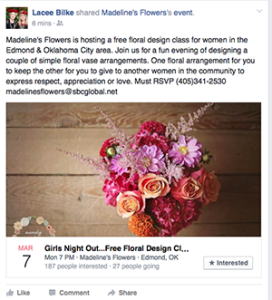 A free design class for female business owners and community leaders is one of several ways Madeline’s Flowers in Edmond, Oklahoma is promoting Women’s Day. Women’s Day doesn’t yet enjoy the same popularity in Edmond, Oklahoma as it does in places like Europe, but Barbara, Lacee and Lenzee Bilke, owners of Madeline’s Flowers, are making strides to change that. The following day, members of Madeline’s Flowers creative team will distribute single flowers to random women in high-traffic areas of downtown Edmond’s business district. Last year, the Bilkes appeared in an article in The Edmond Sun about the history of Women’s Day, the joy a single flower can bring, and the background of their own female-run business.